On An Overgrown Path: Body Mandala - a contemporary classic? Body Mandala - a contemporary classic? Why do we make life so complicated? Making a great recording is really quite simple. All you need is some outstanding music, an orchestra and conductor who thrive on risk taking, a first-rate recording venue and a visionary record label to release the result. Which is precisely what this new release of Jonathan Harvey's music delivers, and believe me it is a truly great recording. 69 year old Jonathan Harvey worked at both IRCAM in Paris and Stanford University, California before a period as Composer in Association with the BBC Scottish Symphony Orchestra from 2005-7. On this CD the BBC Scottish perform five of his compositions under their dynamic, and outgoing, young Israeli Chief Conductor Ilan Volkov. There is a transcedental theme to the programme, with the song cycle White as Jasmine, which is beautifully sung by Finnish soprano Anu Komsi, using Hindu texts and three of the four orchestral works reflecting the composer's preoccupation with Buddhism. From the three Buddhist inspired works Body Manadala must surely become a contemporary classic. It is has its origins in Buddhist ritual music, and uses Western instruments to mimic the famous Tibetan low horns called tungschens seen on the excellent cover above. 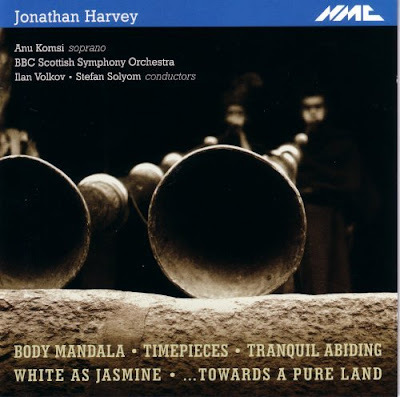 The opening of Body Mandala with its low horn calls echoes Philip Glass' 1997 score for Martin Scorsese's Kundun, but whereas Glass stays in his own stylistic comfort zone Harvey takes us post-Boulez and beyond. The sole work without religous connections is Timepieces which uses two orchestras and two conductors (Stefan Solyom conducts the second group) and three rhythms to pay homage to Gruppen, a seminal work by another Harvey influence, Karlheinz Stockhausen. Everybody involved in this recording deserves credit, with special mentions for independent label NMC who continue to tread where the majors fear to go, and to BBC Scotland staff engineer Graeme Taylor for capturing the ravishing sound of the refurbished Glasgow City Halls. But the real heroes are the BBC Scotish Symphony Orchestra and Ilan Volkov who delight in music making on the edge while their compliant cousins in the BBC's London based BBC Symphony remain happy to provide a platform for Jiri Behlolavek's global ambitions. What a delicous irony that the BBC Scottish are now upping the ante on the BBC management in London who tried to disband them in 1980. Highly recommended, particularly to those who are "tired of the Brits shoving their immature wunderkind composers down our throats". Lots more Jonathan Harvey resources here. Keep giving Kyle Gann a kicking, Pliable, he thoroughly deserves it. Love the NMC label, I love their James Dillon series. I hope that they release at some point the BBC recording of Birtwistle's incredible The Second Mrs. Kong or a recording of Mr. Harvey's recent opera Wagner's Dream, which got good reviews. Pliable, thanks for this post. I tried to order the new NMC Jonathan Harvey yesterday, after reading here, but as of now they only appear to have MP3's of the works available this side of the pond (and I am not an MP3 type of guy). Your travels, again, look to have been fantastic!